The Flying Magic Butterfly® gives wings to your communication : The Magic Butterfly flies away of your advertisements, documentations, brochures, cards, newspapers, books to surprise and amaze your addressees. 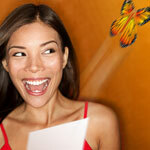 Test it and create the butterfly effect! petitbag® First small bag to collect waste car. Useful and ecological. 18 colors. Real communication tool for your brand.